I recently lost my Dante, a little grey mouse who enjoyed two and a half years on this Earth. He was by nature a prey animal - geared to flee from anything bigger than he was. Weighing in at 0.09 pounds, that meant he had a lot to fear - including a big human like me. Yet from the beginning I showed him he could trust me. I never picked him up, always let him decide whether he wanted to crawl into my hand. Soon thereafter, he enjoyed curling up in the palm of my hand to indulge in scratches behind the ears and under the chin, as well as the gentlest of massages on his impossibly teeny shoulder blades. He would enjoy this for literally hours on end. He could close his eyes and relax. This is how I know mice feel pleasure and pain. From Dante, I also learned that mice grow very attached to humans and are capable of loving them if given the chance. Dante could distinguish the sound of my voice from others'. He would come running from the other end of the room if he heard me call out to him. Whereas his rodent instincts might tell him to run away when given freedom, he preferred to instead spend his life with me. He sought this giant human for comfort. Now that is perhaps the most astounding honor I could ever have - to be so loved that he had no need for the instincts that told him to run and hide. Losing him has left me in emotional shambles, as I cannot fathom never experiencing this wonderful interaction again. However, tonight I did some casual research and found that Pope John Paul II declared that "the animals possess a soul and men must love and feel solidarity with our smaller brethren", and that animals are "fruit of the creative action of the Holy Spirit and merit respect" and are "as near to God as men are". This is from www.SaintFrancisFoundation.com. St. Francis of Assisi is the patron saint of animal care. Reading this changed so much of my emotional reaction. While I will miss Dante, I can take comfort knowing that he is heavenbound, wherein all his ailments from old-age will be erased. I will someday delight in holding Dante again. Every time an animal is hurt, a soul suffers. An act against an animal is an act against God, for that is one of his precious creations. 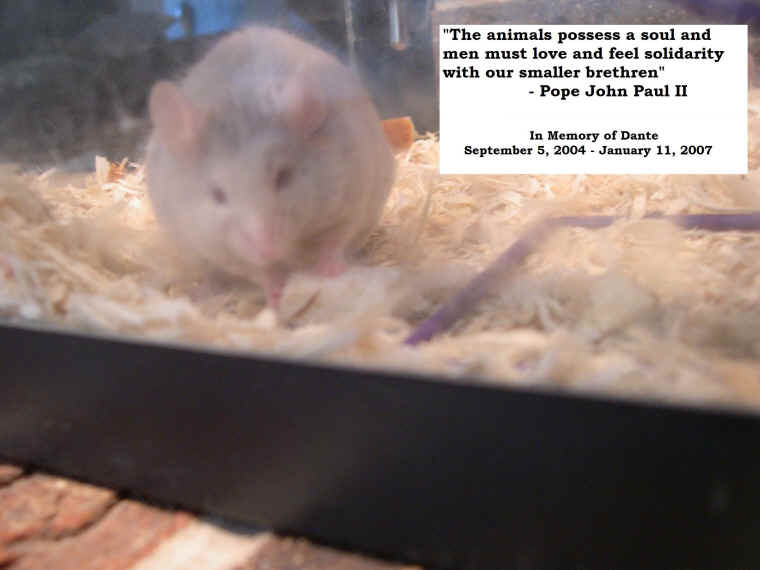 I loved Pope John Paul's quote so much that I affixed it to a picture of Dante and now use it as memorial image. I've attached it to this e-mail. You have my permission to use it if you ever see fit. Just take a glimpse at that beautiful, gentle little face. I was lucky enough to see it everyday in person. I adore Dante, and hope that his legacy will continue, perhaps somehow freeing some of his cousins from undue harm from the hands of man.